Aedán welcomes you to his sheep farm. His ancestors have been farming this land for centuries, and the farmhouse is about 150 years old! Hold a baby lamb and watch the farm sheepdog do his work. Visit the beehive huts– and perhaps have your photo taken in a Jedi pose! Stop for a while to enjoy the view across to the Skellig Islands (maybe spot a pod of dolphins! ), and have a coffee. Hear about life in the old farmhouse (also available to stay in overnight with Airbnb). 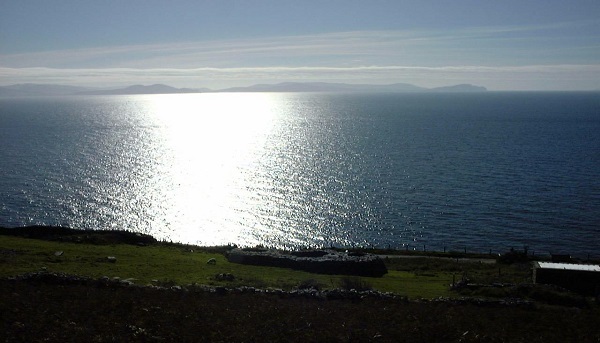 We are situated on the Dingle Peninsula in County Kerry in the south-west of Ireland. We are directly on the Wild Atlantic Way, right beside the carpark/discovery point for Ceann Sleibhe (i.e. Slea Head), which tells you that you have reached one of the most spectacularly beautiful parts of the drive! Enjoy spectacular views of the dramatic Atlantic Ocean (how many boats can you see? ), and of the Blasket Islands, of Skellig Michael and the Iveragh Peninsula (Ring of Kerry). On a fine day you can see the highest mountain in Ireland, Carrauntoohil, from here. We are also along the Dingle Way(Slí Chorca Dhuibhne) hiking trail, so a great place to stop for a break.